I have been playing at lawn tennis with a young lady (writes Major Walter Wingfield, the inventor of that splendid game—to whom the thanks of the community at large are decidedly due) and I have vanquished her. She is younger and quicker than I am, and lawn tennis requires these qualifications, not great strength or vast endurance; so a woman can play as well as a man—this one did. How then, did I win? Listen, and I will tell you a secret. I won the game simply because I was dressed for lawn tennis, and she was not. Now why should this be? When she goes out riding she puts on a riding habit. When she goes to bathe she puts on a bathing dress. Why, therefore, when she plays lawn tennis does she not put on a lawn tennis costume? Thus I mused; and then, as I leaned back in my easy-chair, I think what sort of dress she might wear, and a vision of a fair form, clad in a tunic of white flannel, with a roll collar, a kerchief of cherry silk tied round her throat, the loose ends showing from under the white collar, a skirt of eighteen inches long, a cherry-coloured band round her waist, and a pair of continuations of white flannel (such as men wear, only looser) floats through my brain. It seems a sensible dress and a modest dress, that should shock no one. Yet I know women are critical about each other’s dress. What will they say to such a startling innovation as this? I am nervous even about making the suggestion, and hopeless about it ever being carried out. Be that as it may, still if any club will start such a uniform, the lady members will reap the greatest comfort and benefit, and compete with all others on the most advantageous terms. After such a dress I have hardly patience to name others, but a Norfolk jacket, with a kilt reaching half-way down to between the knee and the ankle, and with a Tam-o’-Shanter cap on the head, would not be bad; neither would a vivandiere’s dress, or a Turkish costume, with pyjamas, and a top skirt down to the knees, be unsuitable. A jersey is a comfortable garment, but I don’t know how to finish it off below. Will Lady Harberton turn her attention to this matter? She will never have a better chance of introducing her divided skirt than as a lawn tennis dress. “Dear Miss C.—I have beaten you most unfairly. The clothes I was playing in only weigh five pounds and a quarter. What do yours weigh? Will you kindly let your maid weigh them—everything you had on—and let me know? The butler begins to think I am not quite sane, but off he goes with the letter, and, when I come down to dinner, I am informed that it has been most conscientiously done, and that it weighs ten pounds and three-quarters. I saw the bundle, it was a big one; but of course I was not allowed to investigate its sacred contents. The dress was a tweed tailor’s-made costume. It follows that my thirteen stone of flesh, bone, and muscle has only to carry five pounds and a quarter, while her nine stone is hampered with ten pounds and three-quarters. If to-morrow she were to play the best man in this house, dressed as I have suggested, and if he were handicapped by having a railway rug strapped round his waist, tied in at his knees, and pinned up coquettishly behind, I should be prepared to lay any wager that she would win. But it was ever thus. From “beach censors” measuring bathing-costume skirts to the committee of the All England Lawn Tennis and Croquet Club, who accused American tennis player “Gussie” Moran of bringing “vulgarity and sin into tennis” for her lace-edged under-knickers, the gentlemen always seem to have an opinion about sports costume for ladies. Still, we must give Major Walter Clopton Wingfield some credit for “insider knowledge.” He was, after all, the founder of the modern game of lawn tennis and the author of two books on the subject. Here we see that gentleman pictured in his own, rather dashing tennis costume, weighing somewhere in the neighbourhood of five pounds and a quarter. This entry was posted in Fashion, Frolics, Gentlemen, News and Announcements, Sport, Victorian and tagged lawn tennis, Major Walter Wingfield, tennis costume, Victorian lawn tennis costume, Victorian tennis, Walter Clopton Wingfield, Wimbledon, Wimbledon fortnight on July 8, 2018 by chriswoodyard. Never try to skate in two directions at once. Eat a few apples for refreshment’s sake, while skating, and be sure to throw the cores on the ice for fast skaters to break their shins on. There is no law to prevent a beginner from sitting down whenever he is so inclined. Skate over all the small boys at once. Knock ‘em down. It makes great fun, and they like it. If you skate into a hole in the ice take it coolly. Think how you would feel if the water were boiling hot. If your skates are too slippery buy a new pair. Keep buying new pairs until you find a pair that is not slippery. In sitting down do it gradually. Don’t be too sudden; you may break the ice. When you fall headlong, examine the straps of your skates very carefully before you get up. That will make everybody think you fell because your skate was loose. Wear a heavy overcoat or cloak until you get thoroughly warmed up, then throw it off, and let the wind cool you. This will insure you a fine cold! After you get so you can skate tolerably well, skate three or four hours—skate frantically—skate till you can’t stand. SAFETY SKATING FRAME. FOR BEGINNERS. Our readers can see the proportions in the cut. The bottom of the runners being slightly curved, the frame is easily turned in any direction. The ends of the runners being turned up, enables the frame to pass over any reasonable impediment, thus saving it from stopping, and being thrown over forwards; the long tails would not allow it to be pulled over backwards. The skater’s hands being placed on the hand rail, between its supports, prevents her from upsetting the frame sideways. Advice on skating abounded, such as How to be Decorative While Ice-Skating and what NOT to do on the ice–A Swell Party on Ice. Mrs Daffodil’s soundest advice is to stay indoors where you may spread oil-cloth on the parlour floor and slide about to your heart’s content, with no danger of frost-bite or pneumonia from an icy plunge. There a simple tug at the bell brings a convenient tray of tea, cocoa, and biscuits, something that cannot be said for frozen ponds, which are generally not equipped with servants’ bells. This entry was posted in Fads, Frolics, Humour and Satire, News and Announcements, Sport, Uncategorized, Victorian, winter frolics and tagged advice for ice skaters, skating frame, skating rink, Victorian ice skating, Victorian skating, winter sports on January 24, 2018 by chriswoodyard. 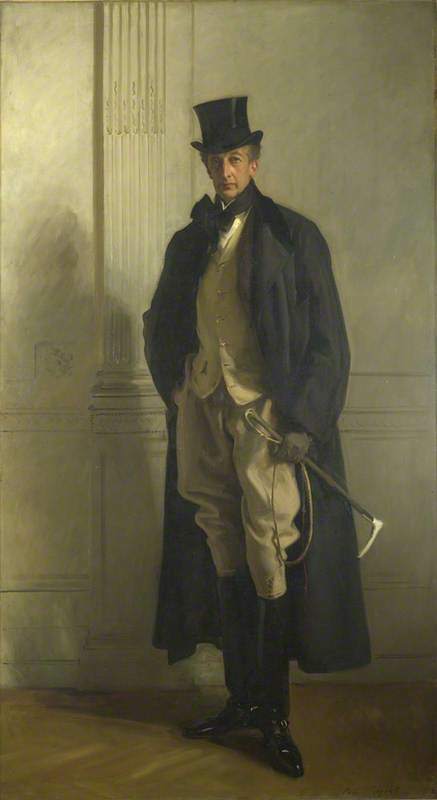 Sargent, John Singer; Lord Ribblesdale; The National Gallery, London; http://www.artuk.org/artworks/lord-ribblesdale-114725. Shown in hunting costume. He was Master of the Buckhounds from 1892-95. When I was about nine years of age, I went to live with my grandfather on a farm near the little town of Yarm, on the banks of the river Tees. One day he happened to be short-handed. He had an order for a ton of potatoes to be delivered in Yarm on that day. He loaded the cart and sent me off to deliver them in the afternoon. It was a November afternoon, therefore, it turned dark early. I delivered the potatoes and set off home later than I expected, in the dark. I knew the old horse knew every inch of the road, and, being a lonely road and practically deserted, I gave the horse his head and laid down in the bottom of the cart on the empty sacks. I got along all right until I landed at a part of the road which led between two plantations, one at each side. I still had about two miles to go, as we lived four miles from the town, when I was startled to hear what I thought was the rustle of a saddle and the tread of a horse on the frosty road. Being lonely and nervous, I jumped up to see what was coming, delighted to think I was going to have company. To my utter surprise, I saw a horseman riding alongside me on a beautiful bay horse. He was dressed in a red coat, white riding breeches, huntsman’s hat, and everything complete. I grabbed my reins to pull off and make way for him, but he kept to the grass at the side of the road. He didn’t speak, but only lifted his whip to his cap in response. I was delighted, as I loved to see the huntsmen and the hounds, although I was surprised to see this one. I knew perfectly well that there was no meet in the immediate district on that day, or my grandfather would certainly have attended it, as he never missed a run when possible to get there. He only looked down on me and smiled. I had then got as far as the gate leading into the fields off the main road to the farm. I got out and opened the gate and let my horse and cart pass through, then still held the gate for the huntsman to pass, as he was standing waiting. Instead of coming through the gate, to my great surprise, he suddenly vanished. I was terribly afraid as I could not make out where he had gone or how he had gone. I let the gate go and jumped into the cart, and made the old horse go as fast as he could for home. Although I had no idea of ghosts then, I landed home scared to death. I rushed into the house and scared my grandfather and grandmother as well. When I got pulled round I related to them what had happened. Then my grandfather said he wouldn’t have let me go if he had thought about it. He said there had been a follower of the hunt killed in those woods two or three seasons before and that he had haunted the woods during the hunting season ever since. My grandfather himself had been present on the very day the accident happened and he said my description of the gentleman tallied exactly with the one who was killed. He had no doubt I had seen and even spoken to the ghost that others had seen riding at night about those woods. He mentioned the incident at the next hunt meet and it was generally accepted that I had seen the ghost. Curiously enough, my grandfather had the misfortune to be killed himself with a horse and lorry sometime after my experience. Whether it had any bearing upon the after trouble that befell me I can’t say, but this goes to prove that there are ghosts. As the saying goes, seeing is believing. Mrs Daffodil’s Aide-memoire: What a vanished world is reflected in the young man’s eagerness to “make way” for the gentleman, the aristocratic ghost’s touching of its cap with its whip, the ghost waiting, with the expectation that the boy would open the gate for him and his horse. Even in death, the social distinctions were maintained by the phantom huntsman and his witness. This entry was posted in Aristocracy, Death, Gentlemen, Ghosts, News and Announcements, Sport, Supernatural, Victorian and tagged English ghost story, ghost horse and rider, North Riding, North Yorkshire, North Yorkshire ghost stories, phantom huntsman, Victorian ghost stories on October 20, 2017 by chriswoodyard. The Sad Result of Using Patent Bathing Houses. A harrowing story comes to us from one of our sea side watering places. Old Mr. Grampus was in Paris last spring, and he brought home with him one of Baptiste’s patent bath houses. It was made of vulcanized silk with steel ribs, and it shut and opened by a spring. 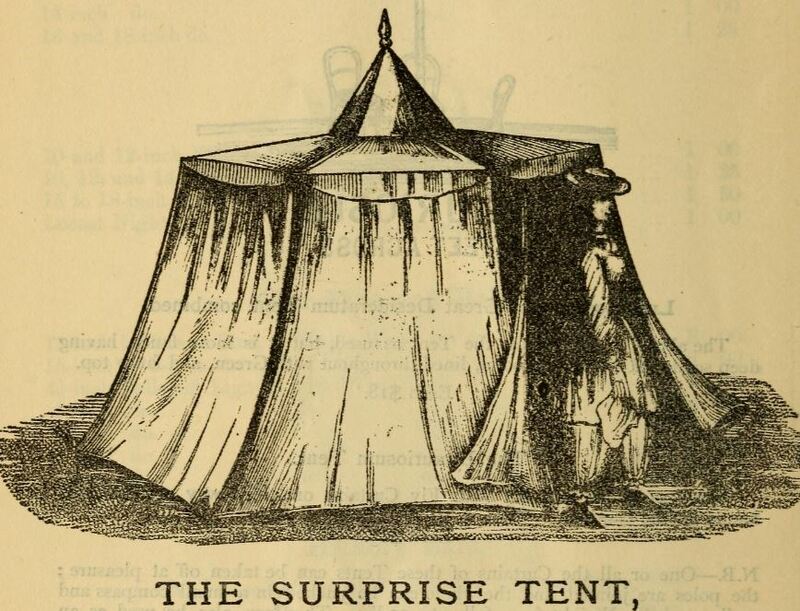 Open it had the appearance of a beautiful blue and buff striped pavilion, octagonal in shape, and covering a superficial area of some ninety or a hundred square feet. Shut up, it looked like a huge Brobdignagian umbrella, though, being very light, Mr. Grampus could carry it to the beach as easy as he did his camp stool. The Grampuses were very proud of this bath-house. They used to take it down to the most crowded point on the sands and flaunt it in the faces of their rivals. It afforded to Mrs. Grampus and the Miss Grampuses a satisfaction more ecstatic than they had ever known before to emerge from this gorgeous edifice just as those odious Millers came sneaking out of their dingy old wooden huts under the cliff. The crowd gazed at them with envy and admiration, while they either pitied or ignored the Millers. Baptiste’s patent bath-house was an object of respectful amazement to the whole caravansary, and the Grampuses came in for no little social eminence and superiority in consequence. This sort of thing went on smoothly for a fortnight or so, until the Millers and the Joneses and the Snagsbys were absolutely on the point of leaving Jolimer for sheer mortification. And perhaps they would have gone the very next day, but for the singular adventure which little Blinker had with his donkey. 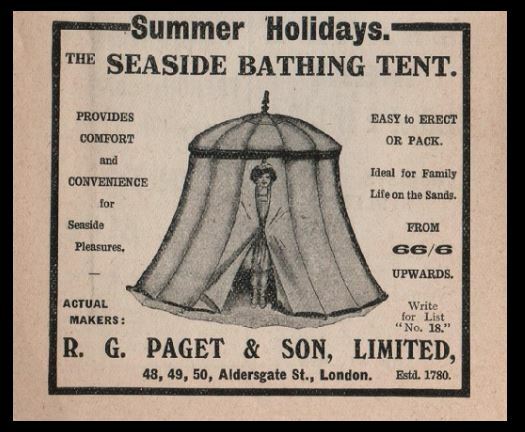 It was about 11 o’clock; the beach had been crowed for an hour or more, and as usual the centre of attraction and of interest was the Grampus bath-house. They had lately embellished this beautiful structure with a pair of golden horns [antlers] and a silk centennial flag, and in the eyes of the unhappy Millers it looked more insolent and gaudy and overwhelming than ever. The Grampus ladies had been inside for a quarter of an hour or so, and the spectators conjectured, rightly as it afterward transpired, that they were almost ready for the surf, when all of a sudden little Blinkers was seen descending one of the winding paths astride a particularly contumacious and evil-minded donkey. His agonized cries and expostulations attracted attention, and in less than a minute every eye, except those of the doomed and unsuspecting Grampuses, was riveted on Blinkers. Here he came, his donkey churning away at the bit, and buck-jumping like a mustang, and be miserable, frantic and helpless with terror. Blinkers stuck, though, and the donkey lunged away down the path like something mad, without shaking off the stricken wretch who rode him. There were a few Ravelian acrobatics, a wild lurch, and then Blinkers and the donkey went kerslap again the Grampuses’ patent bath-house! One complicated shriek shot through the air, a flutter and a rattling as of machinery, and the next instant Blinkers was dashed upon the sand in a crumpled heap, and a haggard and affrighted donkey with his ears pinned back and his tail between his legs, was seen hustling down the beach like some panic-stricken meteor. And then the great Grampus pavilion with a creak and a snap, suddenly shut itself up into umbrella shape, and waddled hysterically toward the surf on a pair of elephantine legs—identified by a spectator as the legs of the Mrs. Grampus—suggesting the idea, with its towering outline and its antlers and its flag, for some gigantic species of horned giraffe which had just taken the blue ribbon at the fair. And that was the end of the great Grampus bath-house tragedy. Old mother Grampus pranced about the beach awhile with the patent bath house sitting on her head like a long but emaciated extinguisher, and the two Miss Grampuses who had escaped the collapse rushed frantically into the surf, with a good deal less bathing dress than they would have had if Blinkers and his donkey had given them a little more time. Next day the family departed before the rest of the world had wakened, and the Millers and the Joneses, and the Snagsbys are having their own way. Now, if this narrative should reach the eye of any family using Baptiste’s patent portable bath-house, we trust they will take warning, and never afterward trust to its protection until it has been enclosed in a serviceable picket fence. Mrs Daffodil has previously written about a bathing machine as the scene of scandal, as well as the ideal bath-house, which will, indeed make one the envy of one’s friends, if not one’s maid. This entry was posted in Fads, Frolics, Gentlemen, Irregular Lives, News and Announcements, Sport, Summer Frolics, Textiles, Victorian and tagged bathing machine, bathing pavilion, bathing pavilion contretemps, bathing tent, Summer Frolics, Victorian bathing machine, Victorian seaside, Victorian seaside humor on August 20, 2017 by chriswoodyard. The dispatch came to the man’s residence, and his wife opened it, and her hair stood right up straight. When the innocent husband came home she put on a refrigerator expression, and handed him a pair of her own old stockings, done up in a paper, and told him he better send them to his blonde darling at North Branch. He was taken all of a heap, and asked her what she meant, and said he had no blonde darling at North Branch or any other branch; and after he had said he did not know a woman any-where, and never thought of supplying stockings to anybody but his wife, she handed him the telegram. He scratched his head, blushed, and then she thought she had him, but finally he laughed right out loud, and went to his room, where he keeps his guns and things, and brought out the new pair of rubber wading stockings, that he had bought for his friend, each of which would hold a bushel of wheat, and handed them to his wife, and asked her how she thought they would look on a blonde darling. Then he told her they were for his sporting friend, of a male persuasion, and she asked his pardon, but insisted that the telegram had a bad look on the face of it, and was enough to scare any wife out of her wits and stockings. The wading stockings were expressed to the friend with a letter, telling him to be mighty careful in future how he telegraphed. Mrs Daffodil’s Aide-memoire: Mrs Daffodil must take the wife’s side: the telegram certainly did have a “bad look” to it and one cannot blame her for being upset. For all she knew, it could have been a genuine instance of a stocking mis-communication which would inevitably lead to a domestic tragedy. One is relieved that this was not another and hopes that the “blonde darling” ceased his “kidding” in future. Mrs Daffodil is reminded of a wag who, as a “joke,” sent out half a dozen telegrams to random acquaintances, reading: “All is discovered. Fly at once!” The men decamped and were never seen again. In the wrong hands, telegraphy is a dangerous weapon. This entry was posted in Courtship, Fashion Accessories, Gentlemen, Husbands and Wives, Irregular Lives, Lethal Clothing, News and Announcements, Seductions, Sport, Victorian and tagged fishing boots, fishing waders, joke telegram, marital misunderstanding, rubber hip boots, rubber stockings, rubber waders on July 9, 2017 by chriswoodyard.